For other uses, see Funkytown (disambiguation). "Funkytown" held a unique record for reaching the number one spot in 28 countries, more than any other single release until Madonna's "Hung Up" reached number one in 41 countries in 2005. It reached the top spot in the United States, Germany, Austria, Switzerland, Norway, the Netherlands, and Australia, among many others. Written by Steven Greenberg and sung by Cynthia Johnson, the song expresses the singer's pining for a metaphorical place that will "keep me movin', keep me groovin' with some energy". It was written while the band lived in Minneapolis with dreams of moving to New York. "Funkytown" entered the US Billboard Hot 100 on March 29, 1980 and spent four weeks at number one, beginning May 31. It also hit the number one spot on the disco chart in 1980. It also reached no. 2 in the United Kingdom, Sweden, and on the U.S. soul chart. The song was Lipps Inc's only American Top 40 hit. 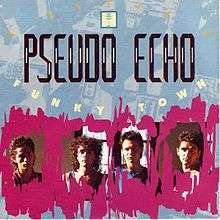 In 1986, "Funkytown" was covered by Australian band Pseudo Echo, who gave the song a different sound, with a guitar solo in the middle of their version. Pseudo Echo's version spent seven weeks at no. 1 in Australia (Lipps Inc.'s was at no. 1 for only two weeks in Australia), and was also a no. 6 US hit in July of the following year, and in August a no. 1 hit in Canada. Mirroring Lipps Inc's experience, Pseudo Echo's version was that group's only US Top 40 hit. This version of "Funky Town" by Pseudo Echo was played in the 1987 sequel comedy film Revenge of the Nerds II: Nerds in Paradise. The music video is a very basic, low-budget typical 1980s video that features the band with their instruments on a lighted, smoke-filled set "performing" the song to a backing track. In the Malcolm in the Middle episode Rollerskates, Hal uses "Funkytown" to teach Malcolm to skate. This song is played in the second-season episode nine of the British drama Skins (E4), when the character Cassie, played by Hannah Murray, dances this song. The song is also included in the Official Soundtrack for season 2 of Skins. The song was also featured in the 229th episode of the hit TV sitcom Friends (The One Where the Stripper Cries, season 10, episode 11). In the South Park episode Towelie, Towelie played the tune to "Funkytown" on the keypad to get into a secret base after getting high. In the 7th episode of the first season of Gotham, entitled "Penguin's Umbrella", Victor Zsasz's phone rings, with "Funkytown" as his ringtone. The song is featured in the films Shrek 2, Contact, The Dictator, Hollywood Homicide, Love on Delivery, and Revenge of the Nerds 2, and also the trailer of Wreck-It Ralph. Nissan has used the song for its commercials. French company Areva has made use of the song for its commercials. Volkswagen used it for its 1997 Jetta commercial. The song as performed by Lipps Inc. also appears on the soundtrack of the 2010 video game Dance Central. The Iranian Delegation to the 2006 Winter Olympic Games had the song played during their entrance to the opening ceremonies. ↑ Huey, Steve. "Lipps, Inc. – Artist Biography". AllMusic. All Media Network. Retrieved June 26, 2013. ↑ Pickow, Peter; Appleby, Amy (1988). The Billboard Book of Song Writing. Billboard Publications. p. 146. 1 2 "Ultratop.be – Lipps, Inc. – Funkytown" (in Dutch). Ultratop 50. Retrieved July 28, 2013. 1 2 3 4 5 6 "Lipps Inc. – Awards". AllMusic. All Media Network. Retrieved May 31, 2013. ↑ Swensson, Andrea (September 22, 2011). "50 cool facts about the Minnesota music scene". City Pages. Retrieved July 28, 2013. 1 2 "Archive Chart: 1980-06-28" UK Singles Chart. Retrieved July 28, 2013. 1 2 "Australia No. 1 hits -- 1980's". World Charts. Retrieved June 9, 2013. ↑ "Austriancharts.at – Lipps, Inc. – Funkytown" (in German). Ö3 Austria Top 40. Retrieved July 28, 2013. ↑ "Top RPM Singles: Issue 7799a." RPM. Library and Archives Canada. Retrieved May 31, 2013. ↑ MusicSeek.info – UK, Eurochart, Billboard & Cashbox No.1 Hits at the Wayback Machine (archived June 14, 2006). MusicSeek.info. ↑ "Toutes les Chansons N° 1 des Années 80's" (in French). InfoDisc. Retrieved May 16, 2016. ↑ "Offiziellecharts.de – Lipps Inc – Funkytown". GfK Entertainment Charts. Retrieved July 28, 2013. 1 2 "The Irish Charts – Search Results – Funky Town". Irish Singles Chart. Retrieved May 31, 2013. ↑ "Billboard Hits of the World". Billboard. Vol. 92 no. 28. July 12, 1980. p. 51. ISSN 0006-2510. 1 2 "I singoli più venduti del 1980" (in Italian). Hit Parade Italia. Creative Commons. Retrieved May 31, 2013. ↑ "Nederlandse Top 40 – Lipps Inc. - Funkytown search results" (in Dutch) Dutch Top 40. Retrieved July 28, 2013. ↑ "Dutchcharts.nl – Lipps, Inc. – Funkytown" (in Dutch). Single Top 100. Retrieved July 28, 2013. ↑ "Charts.org.nz – Lipps, Inc. – Funkytown". Top 40 Singles. Retrieved July 28, 2013. ↑ "Norwegiancharts.com – Lipps, Inc. – Funkytown". VG-lista. Retrieved July 28, 2013. ↑ "South African Rock Lists Website SA Charts 1969 – 1989 Acts (L)". Rock.co.za. Retrieved July 28, 2013. ↑ "Swedishcharts.com – Lipps, Inc. – Funkytown". Singles Top 100. Retrieved July 28, 2013. ↑ "Swisscharts.com – Lipps, Inc. – Funkytown". Swiss Singles Chart. Retrieved July 28, 2013. ↑ CASH BOX Top 100 Singles – Week ending MAY 31, 1980 at the Wayback Machine (archived September 15, 2012). Cash Box magazine. ↑ RECORD WORLD #1 HITS 1980 at the Wayback Machine (archived May 27, 2003). Record World. Geocities.com. 1 2 3 "Forum – ARIA Charts: Special Occasion Charts – Top 100 End of Year AMR Charts – 1980s". Australian-charts.com. Hung Medien. Retrieved July 10, 2014. ↑ "Jahreshitparade 1980" (in German). Austriancharts.at. Hung Medien. Retrieved July 10, 2014. ↑ "Jaaroverzichten 1980" (in Dutch). Ultratop. Hung Medien. Retrieved July 10, 2014. ↑ "Top 100 Singles". RPM. Vol. 34 no. 6. December 20, 1980. Retrieved May 16, 2016. ↑ "TOP – 1980" (in French). Top-france.fr. Retrieved May 16, 2016. ↑ "Top 100-Jaaroverzicht van 1980" (in Dutch). Dutch Top 40. Retrieved July 10, 2014. ↑ "Jaaroverzichten – Single 1980" (in Dutch). Single Top 100. Hung Medien. Retrieved July 10, 2014. ↑ "End of Year Charts 1979". Recorded Music New Zealand. Retrieved May 16, 2016. ↑ "Schweizer Jahreshitparade 1980" (in German). Hitparade.ch. Hung Medien. Retrieved July 10, 2014. ↑ "Top 100 Hits for 1980". The Longbored Surfer. Retrieved July 10, 2014. ↑ The CASH BOX Year-End Charts: 1980 at the Wayback Machine (archived September 15, 2012). Cash Box magazine. ↑ "Canadian single certifications – Lipps Inc – Funkytown". Music Canada. ↑ "Les Singles / Titres Certifiés "Or"" (in French). InfoDisc. Retrieved May 16, 2016. ↑ "Les Meilleures Ventes "Tout Temps" de 45 T. / Singles / Téléchargement" (in French). InfoDisc. Retrieved May 16, 2016. 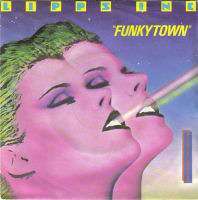 ↑ "Gold-/Platin-Datenbank (Lipps Inc.; 'Funkytown')" (in German). Bundesverband Musikindustrie. ↑ "Here's 100 great songs designed to be the soundtrack to your summer". News.com.au. December 13, 2014. Retrieved May 16, 2016. ↑ Sutton, Michael. "Pseudo Echo – Love an Adventure". AllMusic. All Media Network. Retrieved June 26, 2013. ↑ "Austriancharts.at – Pseudo Echo – Funky Town" (in German). Ö3 Austria Top 40. Retrieved July 28, 2013. ↑ "Ultratop.be – Pseudo Echo – Funky Town" (in Dutch). Ultratop 50. Retrieved July 28, 2013. ↑ "Top RPM Singles: Issue 0847." RPM. Library and Archives Canada. Retrieved June 4, 2013. ↑ "Offiziellecharts.de – Pseudo Echo – Funky Town". GfK Entertainment Charts. Retrieved July 28, 2013. ↑ "Charts.org.nz – Pseudo Echo – Funky Town". Top 40 Singles. Retrieved July 28, 2013. ↑ "South African Rock Lists Website SA Charts 1969 - 1989 Acts (P)". Rock.co.za. Retrieved July 28, 2013. ↑ "Swedishcharts.com – Pseudo Echo – Funky Town". Singles Top 100. Retrieved July 28, 2013. ↑ "Swisscharts.com – Pseudo Echo – Funky Town". Swiss Singles Chart. Retrieved July 28, 2013. ↑ "Archive Chart: 1987-08-29" UK Singles Chart. Retrieved July 28, 2013. 1 2 3 "Pseudo Echo – Awards". AllMusic. All Media Network. Retrieved May 31, 2013. ↑ CASH BOX Top 100 Singles – Week ending JULY 11, 1987 at the Wayback Machine (archived October 6, 2012). Cash Box magazine. ↑ "Top 100 Singles of '87". RPM. Vol. 47 no. 12. December 26, 1987. Retrieved May 16, 2016. ↑ "End of Year Charts 1987". Recorded Music New Zealand. Retrieved May 16, 2016. ↑ "Top 100 Hits for 1987". The Longbored Surfer. Retrieved July 10, 2014. ↑ "Top Dance Sales 12-inch Singles". Billboard. Vol. 99 no. 52. December 26, 1987. p. Y-30. ISSN 0006-2510. ↑ "Towelie (Season 5, Episode 8) – Full Episode Player – South Park Studios". South Park Studios. Retrieved July 28, 2013. ↑ Mancuso, Vinnie (March 11, 2014). "'Gotham' Reference Guide 1×7: Take Me to Funky Town". The New York Observer. Retrieved November 6, 2014. ↑ Phares, Heather. "Original Soundtrack – Shrek 2". AllMusic. All Media Network. Retrieved July 14, 2013. ↑ Hendrix, Grady (April 8, 2005). "Sometimes a Movie Is Like a Miracle". The New York Sun. Retrieved April 20, 2016. ↑ "Lipps Inc dans le Spot TV de Areva" (in French). Musiquedepub.tv. Retrieved March 22, 2014. ↑ "1997 VW Jetta Commercial - Lost in America". YouTube. Retrieved August 7, 2015. ↑ "Dance Dance Revolution SuperNOVA Track Listing". IGN. August 24, 2006. Retrieved July 14, 2013. ↑ "Only in this spectacle can Iran get funky". National Post. Postmedia News. February 11, 2006. Retrieved July 28, 2013.